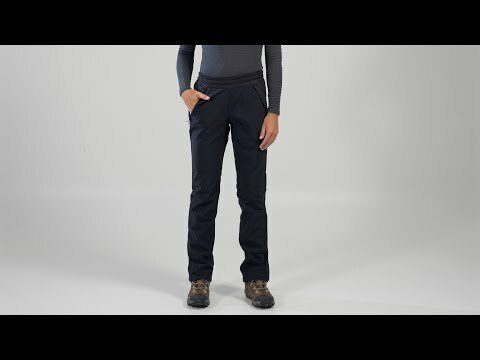 Comfortable and versatile soft-shell pants to use for low-key winter activities. With fleece inside, they feel nice worn solo, or pair them with a base layer for extra warmth. The windproof, water-resistant fabric blocks cold blasts on your thighs to promote longer snowshoe rambles or dog walking sessions. Made of polyester, polyurethane and spandex with a DWR (durable water repellency) finish. Soft and comfy fleece inside. 2 zippered front slash pockets to warm up chilled fingers. Wide elastic waistband with external drawcord to fine-tune the fit. Straight-leg cut gives them a casual look for walks around the neighbourhood. Drawcord at the bottom hem to help keep the snow out.